I felt nauseous with anxiety when I walked into the theater to see Spider-Man 3. I just couldn’t believe I was seeing the next Spider-Man movie! I knew it was coming, but as with many events we look forward to so much, I just couldn’t believe it was finally here. I don’t know if I’ve ever been this excited about a movie. Spider-Man 2 is one of my all time favorites, and holds a special place in my heart as being the first film I reviewed for the Colorado Kids. My expectations had never been higher. Naturally, the film couldn’t live up to my expectations. That’s not a mark against this movie; no film could live up to my unbelievably high expectations. Once again, the film is more of a character study then it is a superhero film. The majority of the film is spent looking deeper into Peter Parker’s character and the people around him. The problem is, this time there are a lot of people around him. Spider-Man 2 was so excellent because they had a very centered, grounded plot; how do you be a superhero when doing so sacrifices the things you want the most? No one in the vast audience the film had had spider powers. We can’t relate to swinging around New York on Webs shooting out of our wrists, but somehow, this question hit very close to home. We’ve all had to make sacrifices to do what we know is right, and even though SM2 dealt with this bleak prospect, it also gave us hope. It Peter can do it, so can we. But Spider-Man 3 is not as grounded. At least not as literally. Before I can explain what I mean, I have to explain some of the plot. Not all of the plot; my computer hasn’t enough hard drive space to do so. Basically, the film starts with Peter at the top of his game. Everyone loves Spider-Man. He’s got the girl, he’s getting straight A’s in his classes; his life couldn’t be better. The Spider-Man trilogy feels very much like a three act play, and if Act One is the origin, and Act Two is the struggle to find identity, then Act Three is the fall from grace. For with great admiration comes great cockiness, as Peter soon learns. As his struggles in life lessen each day, he becomes cockier. And when Flint Marko (played brilliantly by Thomas Haden Church), escapes from prison, things are going to get a lot worse. Marko was the man who really killed Uncle Ben. Peter obviously wants revenge, but that becomes difficult when Marko is involved in a particle physics accident and his body is mutated into sand. Marko is now the Sandman, and could very well be the toughest opponent Peter has ever faced. And he’s the man Peter wants to kill more then anyone else. Uh-oh. Peter’s revenge story is mirrored in Harry’s story. In SM2, Harry learned that Peter is Spider-Man, and still thinks that Spider-Man killed his father. So Harry sets out to kill Spider-Man, but ends up giving himself amnesia. Harry and Peter are friends again, but how long will it last? Of all the many plots SM3 has, this one is the best. It’s very human, and mirrors Peter’s desire for revenge perfectly. But there’s this mysterious black substance that landed in a meteor near where Peter and M.J. were on a date, and it seems to like Peter. The substance amplifies all the negative qualities of a person, and when it attaches to Peter, his perfect life begins to unravel. Basically, the film’s first half is all about setting up everything. It’s kind of slow, and the plots don’t seem connected. But as Peter’s desire for revenge becomes stronger, we start seeing the negative sides of his personality, such as his cockiness, his ego, and his tendency to ignore M.J. when she really needs him. When the black substance mixes with him, all these qualities come out and take him over, and the film takes off like a jet. Every plot suddenly falls into place. It becomes the film I’d been waiting for since June 2004. The fall from grace story is always a fun, meaningful one, and SM3 pulls it off extremely well. But the thing is, to tell the story of Peter’s fall from grace, the filmmakers decided to put in lots of stories and villains that mirror Peter’s life, to amplify the fall from grace theme. There’s a bit too much. It’s poignant, yes, but I think they bit off a little more then they could chew. The effort is A+, but the result is B+. SM2 worked because they chose to have one story mirror Peter’s, and that was Doc Ock’s. His life and story reflected Peter’s life and struggles, and it worked to great effect because they had time to flesh out both stories enormously. While all the plots in SM3 essentially do the same, there’s so many of them that none of them have the time to flesh themselves out and become as poignant as they really are, or at least as poignant as Doc Ock’s was. But at the same time, I don’t think SM3 would have worked as well with one villain, one mirroring plot. However, having no less then five mirroring plots goes overboard. Flint Marko’s story as Sandman works. Harry’s story in becoming the new goblin works. M.J. becoming more like Peter was in SM2, down on her luck, works. Eddie Brock as a new photographer whose life is a lot like Peter works.....until he becomes Venom, the best known villain from the comics. Now, Venom is cool, I won’t argue that. And if you’re a fan of the comics, you’ll never find a problem with Venom in this film. You just want to see Venom. But I’m not a fan of the comics; I’ve never read them, and thus can take an objective stance on this whole thing. I think in the message the film was trying to convey, Venom is the one plot that doesn’t quite fit. He feels tacked on, as if he is only there to please the comic book nerds. It’s perfectly adequate, and is lots of fun, seeing how the black substance affects Eddie Brock as opposed to Peter, but the way Venom is introduced and played out doesn’t quite work. With some tweaking, it would be perfect, but for now, it’s just good. Not great, good. I think omitting Venom completely would give the film less depth, but growing the character more and letting it flesh out a little would have worked better. The final mirroring story is Gwen Stacey. I know what comic book fans are saying now. “Gwen Stacey? But at this point in the story, she’s dead.” See, in the bridge scene from SM1, when the green goblin drops the ferry-load of people and M.J., Peter saves everyone. But in the comics, it wasn’t M.J. in that scene. It was Peter’s first girlfriend, Gwen Stacey. And he didn’t save her. She died. Gwen Stacey also feels a bit tacked on, as if she’s just there to please the nerds, but as the film progresses, we see she is plot the mirrors M.J.; she’s a sort of love rival. It’s well done, but again, with some tweaking, would have worked much better. So basically, the film works, and works fabulously well in some parts, but with some tweaking, it could have been better. The filmmakers bit off a bit more then they could chew, but the effort is unmistakably valiant. See, they’re trying to tell a fall from grace story, but even more so, a battle within story. Even though Sandman can be as tall as a skyscraper, and Venom is ungodly powerful, Peter’s greatest challenge is in himself, and the mysterious black substance is only a way of showing it to him. Peter’s ego, desire for revenge, and general cockiness leads him to making his own worst enemies. Sure, Sandman killed his Uncle, but Peter never stops to think why, and keeps vanquishing Sandman’s plans to rob money, making Sandman hate him. Flint Marko only wants money to save his dying daughter, and Uncle Ben got caught up in one of his desperate schemes. Peter also screws Eddie Brock over, and makes his own worst enemy there. The last half of the film is when all this is shown, where all the plots connect, and this last half is excellent. It is hindered by some of the flaws listed above, but once Peter gets infected with the alien substance and becomes a total jerk, it’s a great deal of fun. Tobey Maguire obviously is having a ball playing a jerk, and it’s some of his best acting in the trilogy. And the ending, while somewhat tragic, leaves you with a good feeling. M.J. and Peter’s relationship pretty much fell apart during the course of the film, but the last scene, which has no speaking at all, shows that these two are meant for each other, and all will be right in the end. Tobey an Kirsten are great on screen together, and in this scene in particular, they’re acting is virtually flawless. Speaking of the acting, while the story may have flaws, the rest of the acting does not. The best thing about these films is the spot-on casting. Thomas Haden Church is perfect as Flint Marko (Sandman) and brings a very human side to a character the audience has been trained to hate. Bryce Dallas Howard is also excellent as Gwen Stacey, and returning cast members like Kirsten Dunst (M.J.) J.K. Simmons (J. Jonah Jameson) and Rosemary Harris (Aunt May) all do exemplary jobs again. But my big complaint in the post-production part of this film is the music. Composer Danny Elfman, who composed the now iconic film scores for the first two, had a falling out with director Sam Raimi, and did not return to score this. 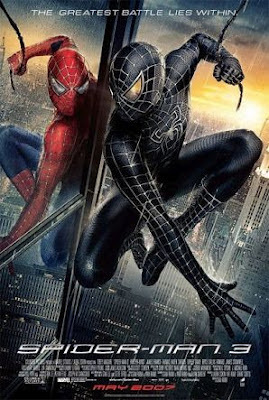 With a 250 million dollar budget, Raimi should have given Elfman another 50 million to return, because composer Christopher Young, who scores this film, does a bad job. The music is okay, but is very, very clichéd superhero music. Elfman’s score makes a few triumphant appearances, and because it’s so much better than Young’s music, when Young’s music plays, it hurts your ears, and brings down a few scenes with it. Seriously, the music is worse then the overly-complicated plot; it is the film’s worst problem. So, in the end, this is a very good film that could have been a very great film. The message about internal struggles the filmmaker’s tried to convey is brought out very well, but could have been done better. The film seems hollow in some parts, and I don’t know why. Something was missing in many scenes, but I can’t put my finger on it. Maybe it’s because this is Act Three, and often, Act Three is a little less deep then Act One or Two. It has to tie off all plots from the first two acts, and sometimes, tying everything off isn’t as fun as getting everything rolling. Flawed though it may be, SM3 presents an almost perfect conclusion, if not an almost perfect film. Am I disappointed? A little. Devastated? No. In a few weeks, I know I’ll like this film more. Now that I know what it actually is, I can slowly slip away from my overwhelming expectations and respect SM3 for what it is; a darn good conclusion to the best superhero series ever made. I can’t really say why my expectations were so high; sure, SM2 was a near-perfect film, and I loved the first two, but I also loved the first two Pirates of the Caribbean films, and my expectations are considerably lower for them. I guess that something about SM2 just connected with me in a deep way, and so my expectations for SM3 were very high. As I said above, the last half is the film I’ve been waiting for for three long years, but it is still flawed, and the first half is a little disjointed. Don’t miss it, but please, don’t get your hopes as high as I got mine. You’ll enjoy it more if you do.